Prime Minister Nguyen Xuan Phuc is welcomed at Haneda International Airport, Tokyo, on Sunday. Prime Minister Nguyen Xuan Phuc has called on Japan to enhance its role in promoting peace and stability in the region.Vietnam welcomes and shares Japan's view on the importance of diplomacy in advocating compliance with international law and peaceful resolution of disputes in disputed waters, Phuc told the Japanese press upon arriving in Tokyo for the 10th Mekong-Japan Summit. A statement from Vietnam's Ministry of Foreign Affairs cited Phuc as saying the international community was concerned about the complicated situation in the East Sea, internationally named as the South China Sea. He called on all parties involved to abide by international law, follow the Declaration on the Conduct of Parties (DOC), and take steps to finalize the Code of Conduct (COC) in the South China Sea. 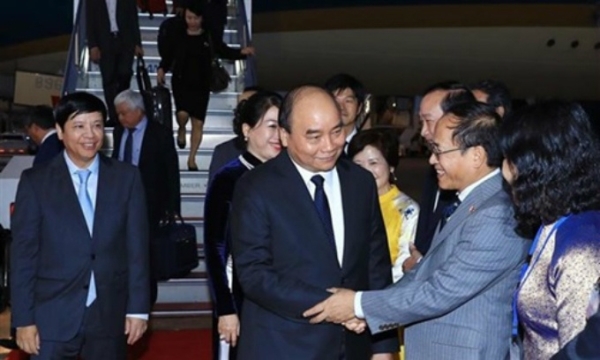 Phuc landed in Tokyo, Japan on Sunday, to attend the 10th Mekong-Japan Summit on October 9.Japan is Vietnam's fourth largest trading partner with a combined trade turnover of $33.4 billion in 2017. The country is also Vietnam’s second largest foreign investor in terms of pledged investment capital, with more than 1,600 projects worth $42 billion licensed by the end of last year.Japan is also the largest official development assistance (ODA) provider to Vietnam and the two nations are implementing large-scale projects in Vietnam, especially in infrastructure and energy. Last month, Kuroshio became the first Japanese submarine to take part in a naval drill in the South China Sea, before docking at the Cam Ranh Port in south-central Vietnam./.